The leader of the United Russia, Vladimir Putin, has invited the party convention to make President Dmitry Medvedev the leader of the elections list in the forthcoming parliamentary poll. ­Putin spoke before the 11,000 strong United Russia convention in Moscow on Saturday and partially resolved the question about the political plans of himself and President Medvedev that political analysts have been pondering for the past year or more – what is the political plan drawn by the two Russian leaders? At the beginning of his speech Putin assured United Russia delegates that such a plan existed and had been agreed a long time ago. Putin assured the party that it was not very important who was doing what in their team with Medvedev, as long as the nation was satisfied with the performance. And elections are the main indicator of such satisfaction, Putin said. Putin said that many people from the party had offered him the chance to lead United Russia’s elections list. He thanked his comrades for this trust, but said that there is an established political tradition – the nation’s president must head United Russia’s elections list. Putin said that this tradition must be maintained and suggested that the convention put President Dmitry Medvedev as the head of the party list for parliamentary elections. The convention greeted Putin’s words with applause. 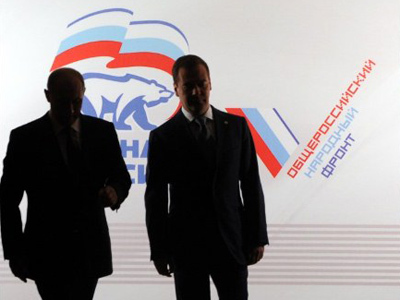 The convention voted almost unanimously to put Medvedev on top of the elections list – 582 votes were cast for the suggestions with only one vote against. Four ballots were considered invalid.